Or whatever you want to call them! About every other night . . .
My sweet husband takes a long skewer and toasts Marshmallows on top of the stove. He does a miraculous job! They are beautiful, golden, toasted to perfection works of art. Today . . . I decided I was going to try making Homemade Marshmallows. I decided on a recipe by Alton Brown . . . his science always seems to work. I went just a step further. then . 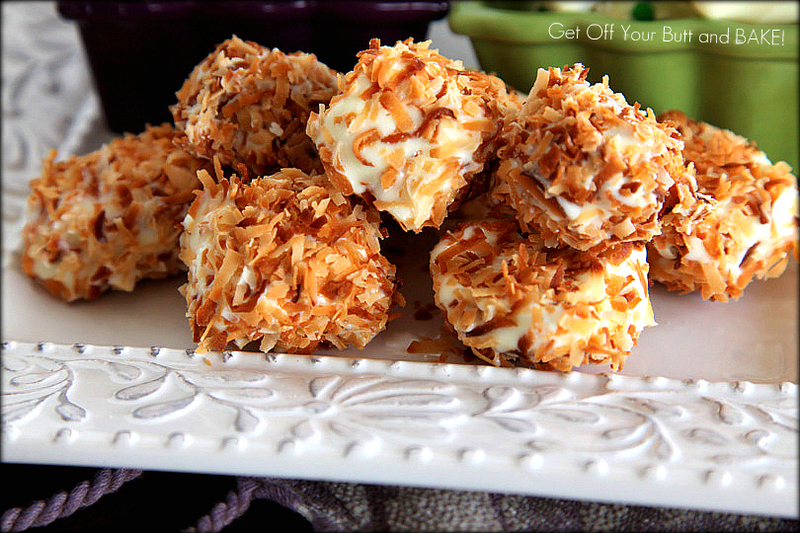 . . rolled in Toasted Coconut. Vanilla Marshmallows dipped in White Chocolate and rolled in Toasted Almonds. Vanilla Marshmallows dipped in Caramel & White Chocolate and rolled in Sprinkles. 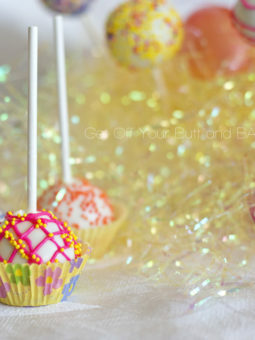 These would be great for St. Patrick’s Day or Easter with Brightly colored Sprinkles. Milk or Dark chocolate would also be yummy, I just didn’t have any lurking around. Run into your kitchen and will whip a batch up together. You’ll need: gelatin, cold water, sugar, corn syrup, salt, vanilla or other flavoring, cornstarch & confectioners sugar for coating. Start by placing the gelatin into the bowl of a stand mixer along with 1/2 cup of the cold water. Let it sit there while you prepare the syrup mixture. Have the whisk attachment standing by for good luck! In a small saucepan combine the remaining 1/2 cup of water, granulated sugar, corn syrup and the salt. Stir well until combined and them place the lid on the pan. Allow to cook covered for 3 to 4 minutes. Uncover and clip a candy thermometer onto the side of the pan and continue to cook until the mixture reaches 240 degrees. (Softball stage) This will take 7 to 8 minutes. Look at the thermometer . . . It’s almost there. My thermometer is almost dead on. Attach the wire whisk to your stand mixer. Turn the mixer on low speed and, while running, slowly pour the sugar syrup into the gelatin mixture. DON’T SCRAPE THE SAUCEPAN. Once you have added all the syrup, increase the speed to high. You can’t sit on your duff while you’re beating the Marshmallow. You must prepare your pan with a combination of Confectioners Sugar and Cornstarch. Combine the confectioners sugar and cornstarch in a small bowl. Put that mix into your metal pan that has been sprayed lightly with cooking spray. The recipe calls for a metal pan, but I do believe a glass pan would also be sufficient. I placed another pan underneath, while I rolled that mixture around to coat the pan. It catches the mess. You want to completely coat the bottom and sides of your pan. Like so . . . Put the leftover mix in a little sifter, and reserve it for the top of the Marshmallow mixture. Is your Marshmallow ready yet? Continue to whip it until the mixture becomes very thick and is lukewarm, approximately 12 to 15 minutes. I set my timer for 13 minutes and it was ready. Add the vanilla or other flavoring during the last minute of whipping. Spray a large spatula with Cooking Spray, so that your gooey Marshmallow doesn’t stick to it. Pour the Marshmallow into your prepared pan. This stuff is thick, and it takes some work to get it out of the bowl!! Sprinkle some of that reserved cornstarch/confectioners sugar mixture on top of the Marshmallow. Now . . . I certainly don’t recommend that you do this, but I did. I was a bit dissapointed that it didn’t fill my 9×13 pan very well. I could have spread it thinner, but it’s just not what I had in mind. So . . . I quickly used some of that leftover confectioners sugar/ cornstarch mixture, sprayed a smaller glass dish and sprinkled that coating in another pan! Warning! My mind was telling me NO . . . don’t do this!!! I did anyway! I picked up that blob of Marshmallow and plunked it into that smaller pan. It didn’t scream back either, it just picked right up. I crammed it into that smaller space. Now, if you want thicker Marshmallows, like a good 1 inch thick, double the recipe, or start out with a smaller pan. The Marshmallows will look much prettier than mine did in the end. YIKES. Let that glorious Marshmallow sit uncovered for at least 4 hours or overnight. You can lick the bowl, the wire whip and every finger on your hand. 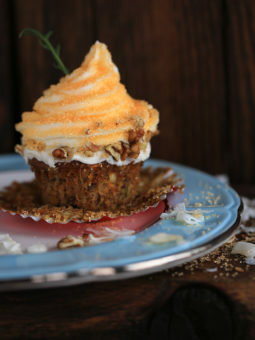 Once the wait is over, dust a cutting board with some confectioners sugar. Turn that pan over . . . PLOP! Coat a Pizza cutter with Confectioners sugar and cut into your desired size. Place your splendid Marshmallows on some wax or Parchment paper. Just admire them a minute, then move on! You can eat them right now, or you can make them a little more gourmet. I decided I would use a large brick of White chocolate that has been lurking in my cupboards for a while now. You can use Candy Melts if you like, but this Chocolate is much yummier! I buy this at Sams Club, but I betcha that Costco has it as well. I also had some Leftover Homemade Caramel sitting in my fridge, that I warmed up. Toast some nuts if you like. I used Almonds today, and a few sprinkles as well. Toasted Coconut was a must as well. Once you have everything assembled and ready, you can start. For those Marshmallows that I dipped in Caramel first, I dipped them, then let them set up briefly before dipping into the White chocolate. Make sure that once you dip into the White Chocolate, you sprinkle with Nuts, Coconut or sprinkles . . . right away . . . before the Chocolate Sets up. 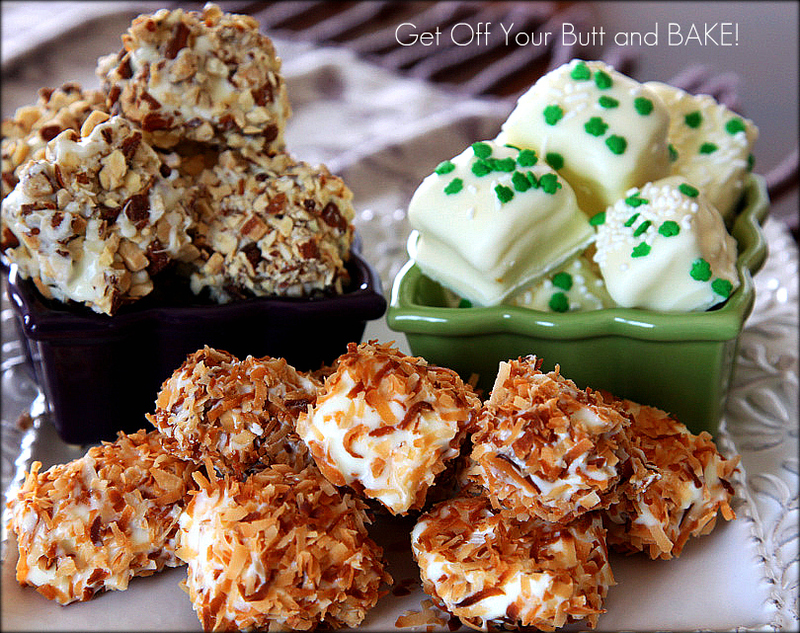 Dip into caramel, let set up, Dip into White chocolate and roll in nuts, coconut or Sprinkles. I’m sorry for lack of pic’s at this point, but my camera screamed in horror at the thought!!!!! It already had Marshmallow finger prints all over it. 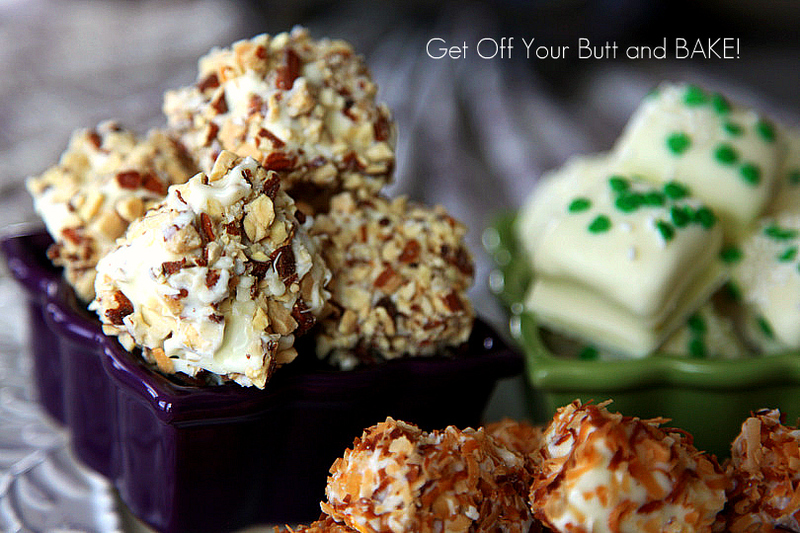 This is the perfect Saint Patrick’s Day treat or upcoming Easter Treat. Another one of my favorite treats with Marshmallows is this! They won’t take you more than 10 minutes to make. Just Click on the picture to find out how to create them. Hello Jonna! Thanks for leaving a comment on RecipeLion’s blog the other day. 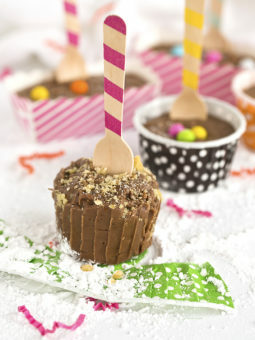 I Love your blog and just fell in love with this marshmallow recipe too, wow. I was wondering, have you ever blog hopped before? 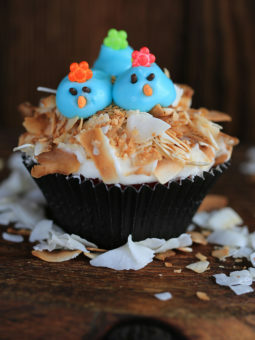 We’d love it if you contributed this fantastic marshmallow one to our blog hop on favorite spring-time recipes. Also it’s a great way to get links back to your site. Hope to see you there!